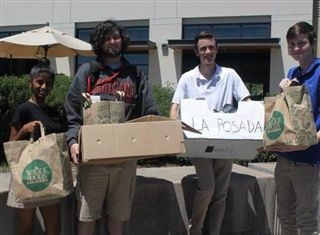 Last month, two Independent Upper School Service Learning groups, Students Supporting Charitable Organizations (which runs food drives to benefit the North County Food Bank) and Lunch Break (a group dedicated to helping the homeless community) teamed up on a food drive to benefit La Posada homeless shelter. On Tuesday, several representatives of each group personally delivered the donated goods. Pacific Ridge sports teams and numerous service learning groups have spent time collecting donations, cooking meals for, and socializing with La Posada residents this year.